Martyn Lawrence Bullard’s style has the elegance and panache of a fancy Hollywood set—and that’s no surprise, given the designer’s long line of A-list clientele and his own notoriety for his award-winning design work. And 2018 was another banner year. Bullard’s own kitchen—fresh off of a remodel and in a home he’d coveted for years—was named Kitchen of the Year by House Beautiful magazine in 2018. The style-rich space is full of glamour, cutting edge technology and nods to the home’s Mediterranean architecture. 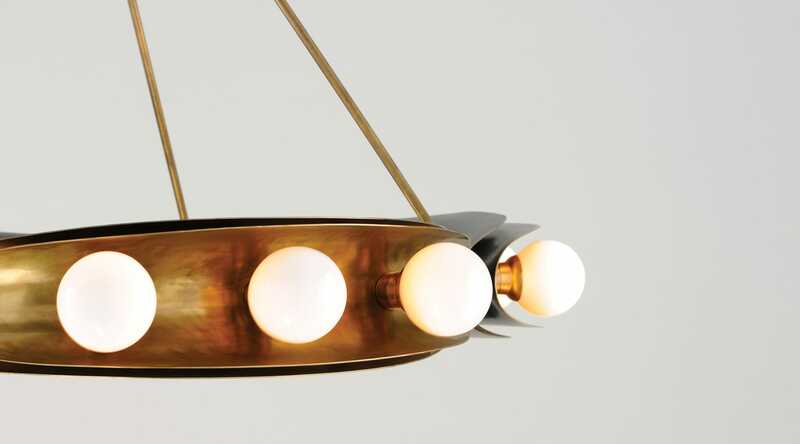 Here, Bullard takes us through his many design inspirations, his new lighting collection with Corbett Lighting and the space in his home he says is built for entertaining. Where do you begin when designing something as monumental as THE KITCHEN OF THE YEAR (and, more importantly, your own kitchen for many years to come). Does it begin with research on the era of the home? The design process is always, firstly, inspired by the architecture and the period of the home. For my own house, I looked at the 1920s Mediterranean architecture and decided to take some Moroccan influences in the design of my kitchen, which is a style that appears within the interior architectural elements of the houses original features. The cabinets and tiles have a period feel, almost exotic, yet all with the most modern appliances and conveniences used for absolute luxury and ease when cooking and entertaining. 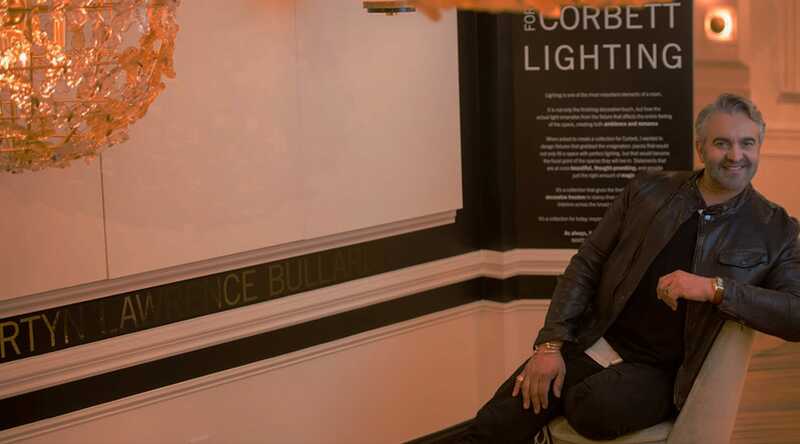 Tell us about the lighting collection you designed with Corbett Lighting. Did the collection start with the Melrose pendant that hangs over your kitchen island? The collection is inspired by my travels and is a mix of the many styles and periods that I love. There are so many pieces that have different expressions to them, which for me makes the collection both fresh and unexpected. The Magic Garden, for instance, was inspired by the paper cut-outs of the camellia flowers that Coco Chanel would decorate her Paris atelier with, eventually becoming her signature of eternal style. The Hopper captures a mid-century look that Dennis Hopper himself loved and used extensively throughout his homes in the 1960s and 70s. The most famed of which, is now, in fact, my own home. Each piece has a story and vibe that’s very personal to me and I am thrilled in how it has evolved into this eclectic, beautiful and strong collection. Editor’s Note: Dennis Hopper was a former resident of Bullard’s current 1920s Hollywood Hills home. Were the fixtures designed with certain rooms or applications in mind? No, when designing the collection, there were no rooms or specific locations in mind, it was more about a feeling and passion for scale, glamour and interior statement. Is the Melrose your favorite design from the collection? Tell us about some of your favorites and the inspiration behind some of the designs. The Melrose is certainly one of my favorites. I love the scale and the French industrial 40’s feeling that it exudes, yet it still feels very modern and strong at the same time. The finish on the mixed metals is aged to perfection, like a fine wine, and adds such history, character and luster to the piece. The Carayes is also a favorite. I love the texture and the scale. Inspired by my love of tropical 70’s vibes and woven fibers, this piece takes center stage wherever it hangs and can be just as beautiful at home in the Hamptons or in the Bahamas. The Milan, with its hand-blown Murano glass butterflies, is a magnificent piece, Italian in inspiration and boldly modern in scale. It’s a complete fantasy and holds a mystical quality, especially when the bulbs are dimmed down allowing the golden flakes in the glass to glow like lightning bugs in the dimmed shadows of the bulbs. We personally love your bar space—it’s amazing—but do you have a favorite thing about your kitchen or home? What is so special about it? I love my kitchen island. It’s not only the perfect place to create meals upon, but it’s also a serving table, a casual breakfast and lunch spot, and it’s the heart of my kitchen. It houses wine fridges, under counter food fridge, porcelain storage and lined silver cabinets as well as a front-loading microwave, rarely used, yet a vital tool. My bar, however, is the highlight of the space. It’s a delicious room that’s welcoming, enticing and has been the scene of much frivolity. 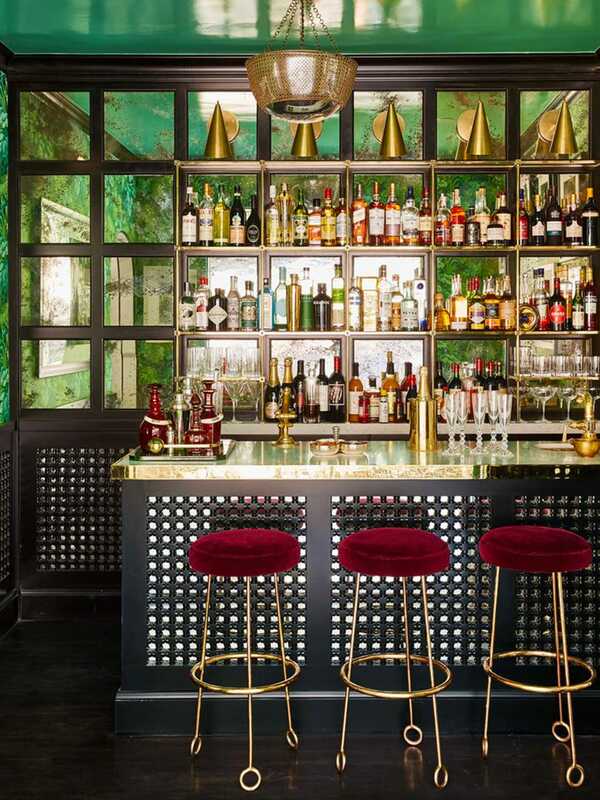 I believe that no home is complete without some kind of bar, whether it’s a bar cart or, in my very lucky case, a complete space that is the most fun spot in the house to entertain! We have so much more to explore in 2019. New chandeliers and ceiling fixtures are of course, in the cards, with scale and detail being the most important design factor. But I am most enthusiastic about our exciting lamp line. It is going to be my new signature collection to add to the assortment. Ceramics, mixed metals, enamel and stone. All mixed, matches and patterned in the most original and fanciful ways. I’m really excited about the new launch and could not be more honored or thrilled to work with such an incredible company and their talented team.